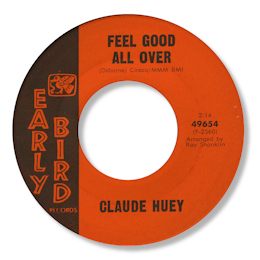 West Coast singer Claude Huey had a handful of 45s out towards the end of the 60s, all of which are well worth looking out for. He worked with Jesse “Ozz” Osborne of Oz & The Sperlings, a childhood friend from his early days in San Francisco. Their first musical collaboration came after Huey left the Air Force, and they took a couple of songs to Galaxy owners Sol Weiss and Saul Zaentz, whom Osborne knew from his Sperlings days. 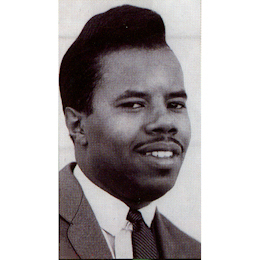 Weiss drafted in Ray Shanklin to produce “Feel Good All Over” which initiated their Early Bird subsidiary. This lively soul blues number showed off Huey’s gospel based vocals to very good effect. Even better were the two 45s which came out on MIOB (Music Is Our Business) set up by Zaentz as a purpose built vehicle for Osborne’s own productions. The first release coupled the uptempo “Keep It To Myself” with the fine bluesy ballad Didn’t We Have Some Good Times on which Huey’s expressive baritone sounded really well at home. The second release featured the famous “Drifting”, a big dance floor favourite, and another heartfelt slowie Just Won’t Believe. 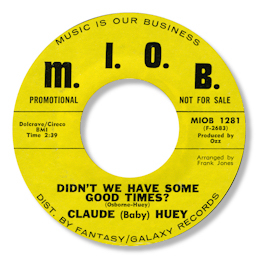 The melody on this one wasn’t quite up to “Good Times” but it does feature some lovely falsetto bursts from Huey, who was at his best. 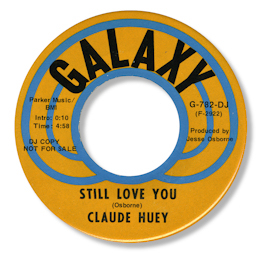 For his final two releases Huey was on the bigger Galaxy label itself. The intial 45 had the excellent Why Did Our Love Go on it. This heartfelt downbeat song had some very tasty chord changes, and the sympathetic setting of piano/organ and subdued horns worked very nicely. Another Northern side “Why Would You Blow It” was the flip. But the best of all of Claude’s records turned out, sadly, to be his last one. Still Love You is one of those stunning tracks that almost compel you to put the needle back to the start of the disc again and again. No question this is Ozz Osborne’s finest moment as a writer, and Huey’s finest as a singer. Check out his blue cadences as he moans and groans his way through the desperate lyrics – and what about those occasional falsetto phrases. The band here – which sounds suspiciously like the Ray Charles aggregation to my ears – deserve the highest praise too. The piano and organ in particular are first rate, as is the big big horn section. Pretty much the perfect soul blues combination. Note ~ “Drifting” and “Didn’t we have some good times” can be found on the Kent UK CD “Moaning groaning crying”. And "Why did our love go" can be found on the Specialty CD "Bad Bad Whiskey".